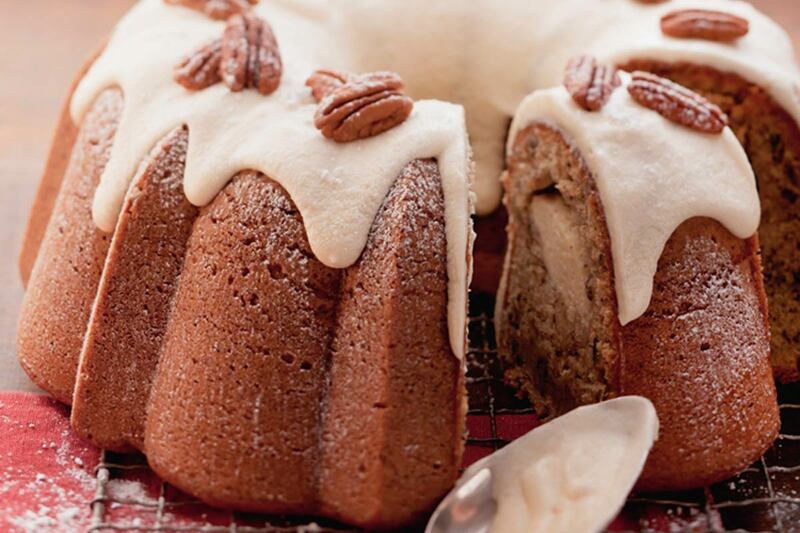 With a creamy banana filling, this Bundt is akin to banana bread with a surprise on the inside. Preheat oven to 160°C with oven rack in center of oven. Prepare your Bundt pan by using a pastry brush and melted butter, ensuring that you reach inside every crevice of the pan, then dust with flour. Alternately, use a baking spray that contains flour and brush excess with a pastry brush to evenly coat the pan. In a small bowl, stir together milk and vinegar; set aside. In a large bowl, cream butter and sugar on low speed until smooth. Beat in eggs one at a time, then banana and vanilla, then beat on a medium speed for 2 minutes. In a medium bowl, whisk together flour, baking soda and salt. With mixer on low speed, gradually beat dry ingredients and milk mixture alternately into batter. Beat for 1 minute then stir in chopped pecans. Pour half of the batter into prepared pan. In a small bowl, beat cream cheese and sugar on medium speed until smooth. Beat in egg and vanilla. Use a teaspoon to spoon evenly around center of batter, being careful to not let filling touch the sides of pan. Spoon remaining batter over filling, covering completely. Bake 45-50 minutes or until top is brown and springs back lightly when touched. Transfer to a wire rack and let cool for 10 minutes before inverting pan to remove cake and allow to cool completely. In a small bowl, beat melted butter, banana, salt and vanilla until smooth. Gradually beat in sugar. Spoon evenly over the cake and let the glaze run down the sides. Allow to cool completely before cutting into wedges to serve.